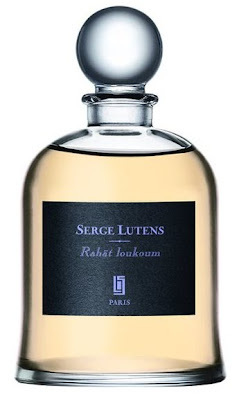 If you ever want a lesson in how the same basic elements of perfumery can combine to produce drastically different effects, you need look no further than Rahät Loukoum and Louve. I wrote about Louve a couple of years ago and could hardly restrain my revulsion for it: a sweet, powdery cherry-almond scent sounds enticing, but it was a horror show, squally and disastrously urinous. I'm sure I have a sample of it lying around somewhere, but I can't bring myself to try it again. And yet when I put on Rahät Loukoum — the name for a candy not unlike what we call Turkish Delight — for the first time, my brain was whipsawed by the memory of Louve, because the two are the same scent, but where Louve is horrifying, Rahät Loukoum is gorgeous. Mind you, it's sweet. Sweeeeeeeet. Dear god, is it ever sweet. Right on the verge of being unwearable. Fat red maraschino cherries in heavy syrup drizzled with honey are the first thing to charge off your skin, followed by thickly sugared almonds and vanilla baby powder. That's just about it for a couple of hours, until a dreamy, drifty musk slowly takes over; still sweet, but not quite as dramatically. I suppose it's vulgar — unsubtle and insistent — but it's appealingly vulgar: that cheerfully loud, slightly over-refreshed party animal with the big irresistible laugh. There is one thing I can't understand about the pair of scents. Rahät Loukoum was launched in 1998; Louve, nearly a decade later, in 2007. Why did Lutens and Christopher Sheldrake feel the need to revisit the idea? What did they feel could be said by Louve that they hadn't said nine years earlier, except, "We're going to take something fun and add a bunch of stuff to make it nasty, just because we can"?